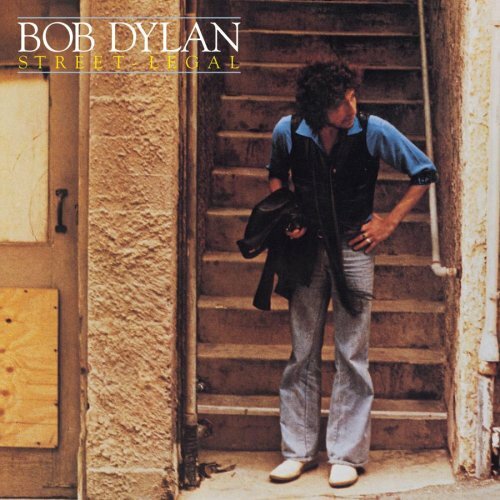 Street-Legal is the eighteenth studio album by Bob Dylan, released on June 15, 1978 by Columbia Records. The album was a serious musical departure for Dylan, who uses a large pop-rock band—complete with female backing vocalists—for the first time. 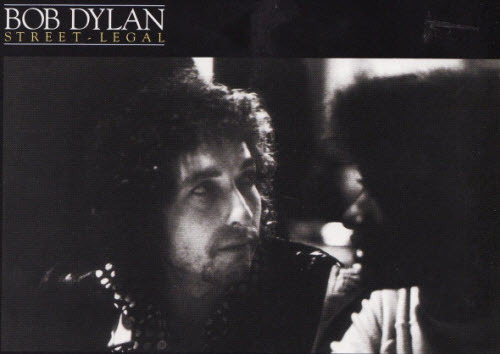 Following the twin successes of Blood on the Tracks and Desire, Street-Legal was another gold record for Dylan, but it peaked at only #11 on the US Billboard charts, making it his first studio album to miss the US Top 10 since 1964. However, it became his best-selling studio album in the UK, reaching #2 on the charts (his highest position in eight years) and achieving platinum status with 300,000 copies sold (the only other Dylan album to do this was The Essential Bob Dylan). 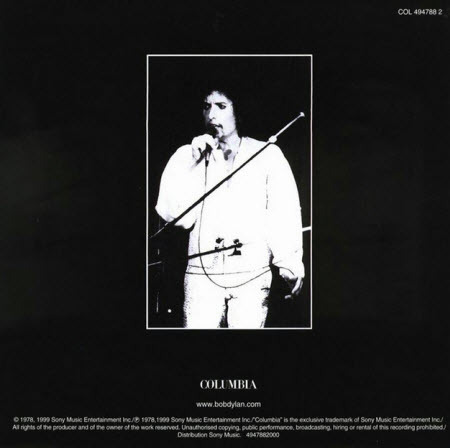 The original 1978 LP credits mastering to Stan Kalina at CBS Recording Studios NY; the album was produced by Don DeVito. In 1999, Street-Legal received a special remixing and remastering job from DeVito. The newer version boasted richer sound, correcting numerous issues with the original production. The new mix was also used in a 2003 SACD reissue of Street-Legal. However the original 1978 mix was reinstated for The Complete Album Collection Vol. 1. Michael Watts of Melody Maker was proclaiming it Dylan’s “best album since John Wesley Harding“. NME’s Angus MacKinnon hailed it as Dylan’s “second major album of the 70s.” In contrast to the record’s still mixed reputation, Q Magazine has given the album a 5 star rating on re-release on two occasions, pointing out that the original muddiness of the production was part of the reason the record has so long been critically overlooked. When Dylan embarked on his European tour, he would be greeted by a generally warm audience reception, and his single, “Baby, Stop Crying” (the lyrics of which were allegedly inspired by Robert Johnson’s “Stop Breaking Down”), would chart in the top ten throughout Europe, and reached #13 on the UK Singles Chart with the album peaking at #2 on the album chart. In the US, however, the single failed to crack the top 100 and the album itself peaked at #11, ending Dylan’s string of #1 albums in America until 2006’s Modern Times. When Dylan continued his tour in America, it would be derided by the American press as the Alimony Tour and later the Vegas Tour, much to Dylan’s chagrin. Many years later, even Street-Legal’s most ardent admirers would admit some flaws in the album, finding most fault with the production. “Street-Legal would be the first in a long line of song collections whose failure to be realized in the studio would lay a ‘dust of rumors’ over Dylan as an abidingly creative artist that he has never been able to fully shake,” writes Heylin. In 1999, Don DeVito revisited Street-Legal and remixed the album with modern, digital techniques in an attempt to improve the mix. Admirers of the album generally seemed pleased by the new mix, but many critics who dismissed the album the first time around remained unimpressed. The new mix was later used in a 2003 SACD reissue of Street-Legal. In 2014, as part of The Complete Album Collection Vol. 1, Street-Legal was again remastered, but restored to its original 1978 Stan Kalina LP mix. Some great tunes, no doubt. Baby Stop Crying’s melody is leaden and it’s the one song I always skip. No Time To Think’s saxophone intro just sounds really naff and it turns me off too. These weak points for me are balanced by some real gems – Señor, Changing of the Guards and Where Are You Tonight? which stand up favourably alongside all of Dylan’s best work. Indeed it is. A true Masterpiece. My very first Dylan LP, bought in the year he came to Rotterdam & Holland for the first time. This LP is the start of a life-time adoration for this man & his music. Changing Of The Guards was & is my favourite track on this LP. This album marks for me the end of a era, ’cause ‘Slow Train’ & the other religion albums didn’t match my expectations & his extreme religious thinking was something I – as a atheist – didn’t like at all. So I started looking back & found Blood on the Tracks, Highway 61, Blonde on Blonde, New Morning… Bootlegs… & by that time ‘Street Legal’ disappeared out of sign. The production & sound was too dull, the songs not powerfull enough for my ears (‘true love tends’ especially was not my cup of tea). Later on, after discovering Robert Johnson & all the others & becoming older… turning back to Street Legal I did like New Poney (of course!) & ‘Where are you Tonight’. ‘Senor’ is a great live-perfomance favourite for me (Utrecht 1995!) . So now, in 2016 I turn this LP on my player now & then, it isn’t bad after all! I saw Bob Dylan play a number of songs from this album just prior to its release.It was in Earls Court London and was such a memorable night.Ive been playing the album ever since. I love this album. I have all of them and this is my favourite. Wonderfully mysterious lyrics. I wish he would play these song in concert . The real 70’s trilogy of masterpieces was completed by Street Legal, it may not be as flawless as the sequence of BABH, H61 and BOB, but it reached out to uncharted territory as well in its writing and sounds. Yet SL was the least revolutionary in its approach to the music and lyrics, it harkened back to 66 and thereby signalled the first time he did look back and took up the burden of his legend, which he had tried to shake off since JWH. He could only lose there, cause it called for comparison in a wrong way. Taken on its own merits Street Legal is a wonderful voyage through the wasteland his mind had become after all the devastating years of his comeback, some of the lyrics show a tiredness and longing for simplicity and certainty, that at the same time seem beyond repair, others are flaming and visionary as if from a magical universe, and god is confronted in fearfully fearless confessions that are made only bearable by disguises in symbols and poetic images (those would get lost in a bad way for a while when he needed a rebirth and grabbed for the cross). The melodies are briliant, building on the richness he had achieved with New Morning, but the album was released after punk and in the midst of disco, and melodies were looked upon with disdain, just as poetry was dismissed as bourgeois or pretentious. Luckily here in Europe there were enough people who kept their longing for artful music. To me Street Legal was the one dearest to me in the seventies. although Blood on the Tracks was evidently his greatest achievement in that decade. To me it expresses our feeling that the candle of the creative sixties would be blown out for a long period, and it proved true. It was a dark prophesy clad in gypsie clothes as Desire, but here they were torn battledresses. We danced on it for a last time. Started waltzing again with Time out of Mind. With Señor and New Pony, this is still among my fav releases. It’s an incredible mix of decadence and depravity into the Dylan we all came to expect, and paved the way for “The Christian Era”. I hope Bob one day plays New Pony live. Keep the fire burning Bob, I know you will. Love this album, I can’t understand why it gets the criticism it sometimes receives. No Time to Think is one of his greatest songs that never gets talked about. I think Baby Stop Crying is the only subpar track on the album but otherwise it’s a real gem.